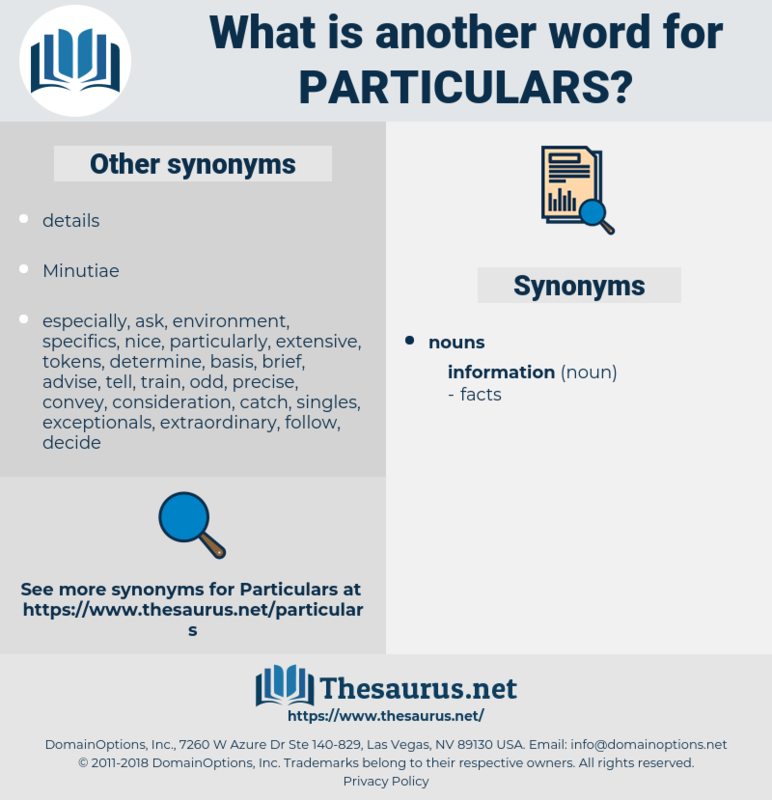 What is another word for particulars? fine print at the bottom. qualifications, explanations, Interrogatories, statistics, insights, Resources, details, renseignements, Inquiries, enquiries, DATOS, Records. 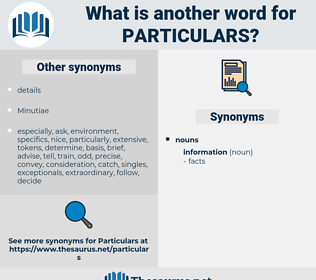 characteristics, instructions, intellectual, parts, literature, considerations, factors, geographical, reference, references, documentation, retailing, articles, clarification, clarifications, clearing, papers, specification, specifications, retail, details, material, materials, renseignements, aspects, credits, explanation, elaboration, please, citations, component, components, elements, element, intelligence, rule, rules, guidance, preliminary, label, notification, directions, case, prompts, pieces, indication, indications, feature, features, mention, mentions, items, inquiry, Inquiries, documents, background, issues, markings, depth, arrangements, datafile, backgrounder, enquiry, enquiries, signage, DATOS, resource, Entries, digest, dimensions, phrases, sheets, ingredients, contact, Slideshow, Records, usage, blocks, notices, breakdown, RFI, statements, GIS, hints, amendment, marks, database, info, Odo, news. individuals, circumstances, communications, pillars, matters, purposes, 'informations, Specialities, celebrations, patterns, corporations, Recommendations, credentials, Qualities, locations, prerequisites, terms, Idiosyncrasies, reports, attributes, subscriptions, Indicated, topics, identification, identifications, representations, commendations, appellations, requirements, specificities, charts, highlights, Minutiae, descriptions, extremes, retailers, parameters, qualifications, Realities, declarations, Duties, preconditions, inscription, inscriptions, Characters, Personalities, differences, Co-ordinates, Regulations, respects, inputs, understandings, subparagraphs, modalities, Identities, explanations, elaborations, additions, coordinates, Interrogatories, Intricacies, recordals, disclosures, composition, applications, traits, informational, affiliations, detailing, Addresses, Technicalities, registrants, allegations, coordinated, Measurements, developments, profile, profiles, annotations, narratives, merits, observance, precisions, nominations, letters, Prescriptions, mechanics, contributions, signposts, sensitivities, pointers, observations, accuracies, hallmarks, metrics, updates, electors, claims, precedents, statistics, definitions, designation, designations, Referrals, Guidelines, certificates, reporting, notations, names, endpoints, readings, marking, backgrounds, identifiers, headings, listings, things, bullets, settings, nuances, Mentioning, numbers, expressions, baselines, folders, appointment, Trees, recordings, announcements, occurrences, searches, registrations, Suggestions, Adjustments, clues, Cues, segments, threads, by-laws, Branches, indicators, strands, distinctions, degrees, Replies, columns, honours, procedures, FACETS, Abbreviations, antecedents, nutrients, timelines, outputs, Summaries, Niceties, contents, informs, grid, refinements, tasks, kits, Subtleties, signals, ends, guides, remarks, variables, Trademarks, Filings, methods, cross-references, bits, brands, Brochures, provisions, Extremities, notes, displays, markers, sightings, endorsement, endorsements, sources, Areas, hits, Exercises, insights, constituents, assets, briefings, specs, wrinkles, grades, files, tips, record, Resources, tokens, words, dossiers, Properties, handouts, accounts, breakdowns, fringes, INS, FAITS, portions, provide, benchmark, benchmarks, questions, drivers, Wonders, contacts, estimates, accents, briefs, submissions, Marques, demands, performances, leads, scans, lengths, communiques, memos, texts, dots, results, Ideas, warnings, bylaws, touches, characteristics, wording, wordings, Stories, uses, footnotes, signs, modes, datasets, sides, comments, honors, admissions, symbols, CVS, messages, enrollments, OUTS, enrolled, feeds, resumes, Indices, views, answers, edges, findings, provides, instructions, number, counts, offers, parts, figures, considerations, factors, LINEs, goods, reference, references, articles, clarifications, papers, dates, specifications, details, detail, material, materials, renseignements, aspects, credits, citations, components, elements, rule, rules, guidance, directions, prompts, pieces, indication, indications, features, mentions, items, Inquiries, documents, issues, markings, arrangements, enquiries, DATOS, Entries, dimensions, phrases, sheets, ingredients, Records, blocks, notices, statements, hints, marks, info, news. indicates, shows, Does, results, figures, references, mentions, Records. In thinking over the particulars of that rather curious buffalo hunt, he could not believe it possible that he was more than two miles from where he had made his start after the creature, and where he separated from them. The information sent to Hulot by the War department proved correct in all particulars.